So if you haven't checked out The Project Bin. It is a must now. Denise the founder and designer of the stamp line is knocking it out of the park with her amazing designs. She just came out with a new set called Deer Mom. It has so many beautiful sentiments for mother's day. I decided to incorporate them on a scrapbook page featuring my mom. How great is the sentiment, Out of all the moms in the word, I'm so glad you're mine. I have a picture of my mom with all her kids and grandkids. I just love these photos. 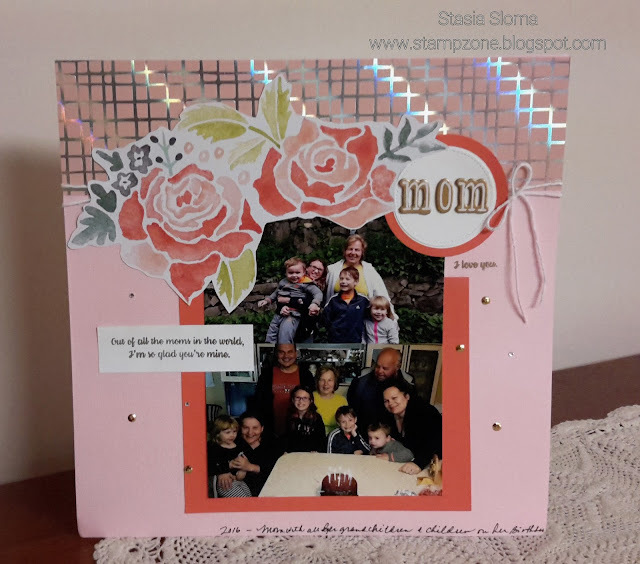 The page background is Pink Pirouette card stock layered with Dear Lizzy Lovely Day designer paper, Calypso Coral card stock. Dear Lizzy alphabet stickers, rhinestones, twine and sequins complete the project.